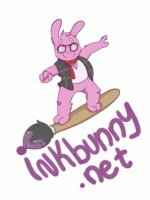 We are pleased to announce the winners for the Inkbunny T-Shirt Competition, which was held to celebrate Inkbunny's 3rd birthday. The Inkbunny staff participated in a range vote to decide five winning designs from a huge number of entries. As there was a tie for fifth place, there are actually six winners! Check out our Redbubble store to see the winning designs and to buy them as shirts, hoodies or stickers. There are a few variations available for some of the designs. Please note that Redbubble dulls the colors in image previews to better represent how those colors will appear when printed on shirt or hoodie material. If you choose stickers as the purchase option, you will see they print brighter than shirts and hoodies as they are on high gloss white sticker paper. Profits from sales go towards paying our ongoing site hosting costs. Buy a shirt, hoodie or sticker from our store to show your support! Thanks to everyone who entered. We really appreciate each and every entry and we are very sorry that only a few could be chosen to be the final designs we'd sell on our store. We hoped that by having more than just one winner, it'd make it more fair for entrants and easier for us to choose. But there were so many fantastic designs that all the Inkbunny staff had favorites that missed out on getting enough points to make the top five this time around. We plan to hold this contest every year so the entries that missed out this time are very welcome to be re-entered next time. Artists please note that of course you keep all rights to your own Inkbunny T-shirt designs, whether they won or not. 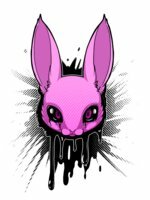 Artists are welcome to sell their own Inkbunny T-shirt designs privately. For instance you could upload them to your own Redbubble account and let your watchers know where to buy your Inkbunny shirt designs. You can still enter them in future Inkbunny T-shirt competitions even if you use them to sell clothing/posters/etc in the meantime. Congratulations to all the winners! Every staff member really liked at least one of them (often two or three), and most were heavy user +favs as well, so I think we have a good batch. Now get out there and buy one to wear for each day of Anthrocon! You know you want to . . . I'm glad most of these don't blatantly display the inkbunny name. ^^;; No offense to those who did, but I still say it's better not to boradcast that information in public (for fear of certain governments' actions). In any case, awesome entries and congrats to the winners. Congrats to everyone ;3 And I gotta get me that Scarletseed shirt! Awesome pieces of art! Congratulations to the winners! ‌Awesome pieces of art! Congratulations to the winners! great ideas always have it! Congratulations to the winners. =3 I'm glad I took a risk, but the best shirts won. Fantastic designs! Congrats to the winners. there was a t-shirt contest ? And you missed it! But you can still make Inkbunny-related art, or draw the staff in compromising positions* for the sake of raising server funds. I feel like this was a competition of artists rather than designs. The voting doesn't bear that out. Several artists entered several designs; each was given very different ratings, even by the same staff members. Remember, we're used to looking at images in isolation! Samkin can always put it up himself if he wants! Maybe as a hat - it'd look real good on that. It's up now, in a variety of products, if you're still interested. I knew Tricksta and RuDragon would win. If I had the time, I would have done this. Next time for sure. Congrats guys. A few runners-up became available later, in case any are to your fancy. shame, was hoping for some rainbow ink. They are all winners! Each has been selected for placement on Inkbunny's Redbubble account and can be purchased right now. I bought two myself. Would buy more, but I already have a lot of t-shirts to wear at events. Please don't go… the cubs need you; they look up to you!